This year marks the 50th year of Nye Association ownership (actual preservation) and the 40th year being open as a museum. In 1665 the Town of Sandwich gave 12 acres in East Sandwich to Benjamin Nye (1620-c.1704), one of the town’s early and long-term settlers, for the purpose of building a grist mill. The reason for this was to encourage competition because Thomas Dexter Jr., who ran the grist mill in the center of Sandwich, was taking a larger toll from each bushel than town officials thought he should get. 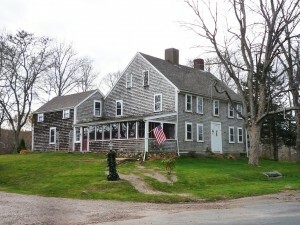 Nye completed building his mill in 1669 on a creek running from Nye Pond (which crosses under today’s Old County Road). He added a fulling mill to the site in 1676. In 1678 he moved his family from earlier dwelling on Spring Hill to a house built next to the mill at today’s #85 Old County Road. In 1806 the Nye mill contained the first carding machines on Cape Cod. This mill was operated by the Nye family until 1867 when it was abandoned. In 1889 a building was moved to the site from Centerville and a second gristmill was established. It did not do too well and the site was purchased by John Armstrong who ran a jewelry and electroplating shop in the building which is still standing today. He and John Carlton started a fish hatchery on the site which was taken over by the Commonwealth in 1912. In 1924 the Nye property including a game farm was given to the Commonwealth which had earlier acquired the fish hatchery. Early concrete in-ground fish tanks remain behind the Grange building, while more recent above-ground circular metal tanks are located behind the Nye house. The hatchery was abandoned around 1990 but the Commonwealth still operates a workshop here. In 1962 the Nye Family of America Association regained ownership of the Benjamin Nye Homestead and since then has been operating it as a museum. They acquired the East Sandwich Grange Hall in 1991. The Nye Homestead is open for tours. Check their website for information. Because Old County Road was the main thoroughfare for stage coaches, the area in the vicinity of the Nye Homestead became a busy country village between roughly 1750 and 1850. The area was known as Cedarville. There was the Nye gristmill and carding mill, a general store, a cobbler, hatter, tannery, two blacksmith shops, a boat shop, post office, about 8 farms, a stagecoach stop and a tavern. The tavern was at 108 Old County Road. It is thought the house here started as a smaller dwelling probably built by Benjamin Nye (1673-1750) who acquired land here around 1699 when he married Hannah Backus. A larger house was then built and occupied by son Benjamin Nye (1717-1801) on his marriage in 1740 to Mary Swift. In 1794 Benjamin sold the property to Joseph Hall and he opened a tavern. The Hall Tavern building later became a farm house. In 1866 Hall’s widow Lydia sold the house back into the Nye family and Samuel Henry Nye, a Civil War veteran established here a rather progressive enterprise called “Mill Pond Farm.” He was able to specialize in dairy products due to the cooling provided by water from an artesian well and an excellent springhouse. The farm had Jersey cattle, poultry, an ice house, orchards, trout pools and a windmill to pump water and run machinery. Cedarville also had its own school. Before centralization the town was divided into 20 numbered school districts. The Cedarville school was in District II, and was located on a small hill a hundred yards northwest of the Old County Road railroad crossing near Hoxie Pond as shown on the 1857 and 1880 maps. The one-room school was known for its excellent teachers and enthusiastic students. By 1845 people who attended the school organized a Friday night reading circle which met in various homes, including the Benjamin Nye Homestead, and created a bi-weekly, hand-written, single-copy literary magazine called the “Cedarville Gem,” which was passed from house to house. This creative effort continued until 1861. Original copies of the “Gem” exist today and are in the Percy F. Rex Collection at the Sturgis Library in Barnstable. 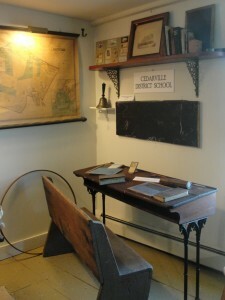 In 1878, men who had been pupils at the old school house, formed the Cedarville School Association, bought the building and lot, and from city and farm, wherever scattered, held a mid-summer meeting within the walls of the old school house. It was modeled into a suitable hall and was the meeting place of the East Sandwich Grange until its own hall was completed. In 1896 the school building was moved to what is now Cedarville Road (a private way), and remade into a farmhouse. It was occupied by R. Frank Armstrong and his wife Rosa 1896-1907, rented for a while, and then given by Rosa to her daughter Anna and husband Sam White. Granddaughter Rosanna Cullity now lives in the old Cedarville School building and has donated an original school desk, school books and other items from the school to the Benjamin Nye Homestead & Museum. These school artifacts are kept in the rear upstairs exhibit room of the Homestead. 108 Old County Road, which housed the tavern, was also a library. From 1861 to 1914 the Cedarville Library operated in a front room of the house. It started with 25 volumes which grew to over 500 in the years to come. Ruth Nye was the librarian, her husband, Samuel, and several neighbors served as trustees. The house and farm passed to Nye’s daughter Rosa who married R. Frank Armstrong. In 1979 their son Lindsay Armstrong, a former Selectman, recorded an oral history interview which is in the Town Archives. Original books and records from the Cedarville Library can be seen today at the Benjamin Nye Homestead & Museum. 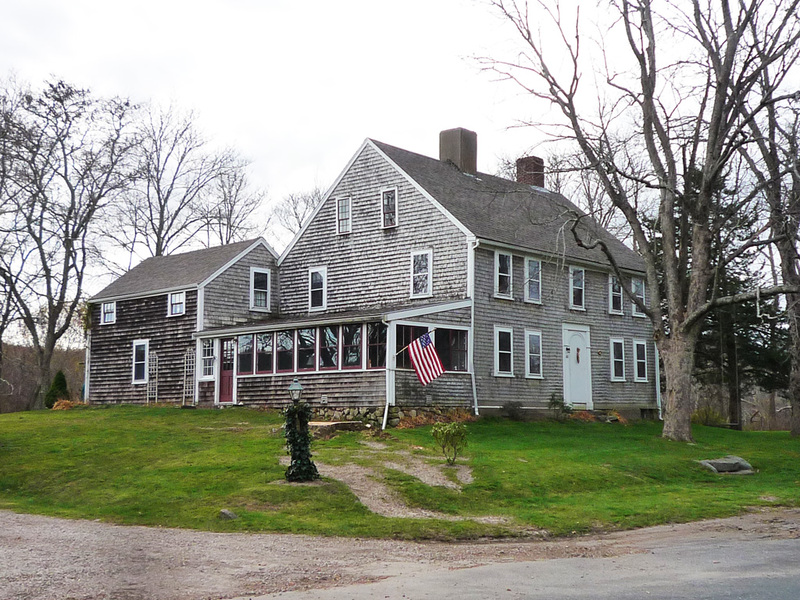 The house at 82 Old County Road (across the street from the Nye Homestead) started as a full cape ca.1765 but was “raised up” to a colonial style at some point. It was occupied by Joseph Nye III (1742-1816) on his marriage to Mary Winslow. Area historian John Nye Cullity stated that this house is “a superb example of a well preserved, late 18th Century structure.” Joseph was a Selectman, a Representative and a distinguished Patriot leader in Sandwich during the Revolution. Number 82 Old County Road passed to Joseph’s nephew also a Joseph, to his son Joseph Jr. and thence was sold, in 1822, to another Joseph: Joseph Hoxie (1798-1890). Hoxie was an important member of the community and of Friends Meeting (Quakers). He kept a shoe shop near the Nye Mill. He was also farmer, postmaster, school committeeman and a Selectman. Joseph also served 2 terms as a state Representative. In June, 1829, he shot a much sought-after wolf which, in previous years, had killed numerous sheep in the Upper Cape area. Hoxie left a large collection of tools, letters and documents to the Sandwich Historical Society/Glass Museum. The house appears on the 1857 and 1880 maps as “J. Hoxie.” In 1904 it passed to Lucy Hoxie (1843-1909) and in 1909 was sold to Samuel and Hannah Jillson. Sam worked at the East Sandwich Fish Hatchery right across the road. There is a pond in back where it is said that Daniel Webster, Grover Cleveland and Joseph Jefferson liked to fish. 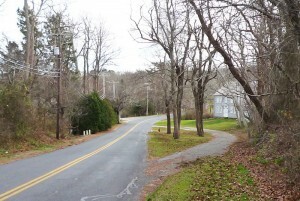 Today’s Old County Road in East Sandwich follows the original route of the Old King’s Highway which followed native American trails meandering along the southern edge of Scorton Marsh. Until about 1847, there wasn’t a road where Route 6A is today. Old County Road was part of the “Barnstable and Sandwich Road” and was the only way to get from Sandwich Center to Barnstable village. 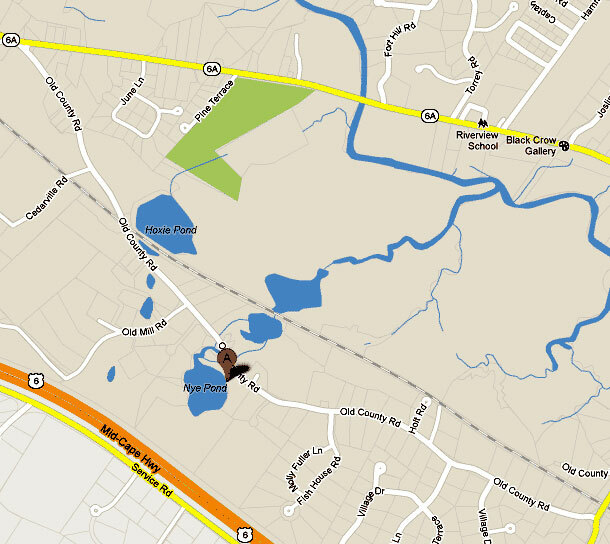 On the map you will also see Old Mill Road. 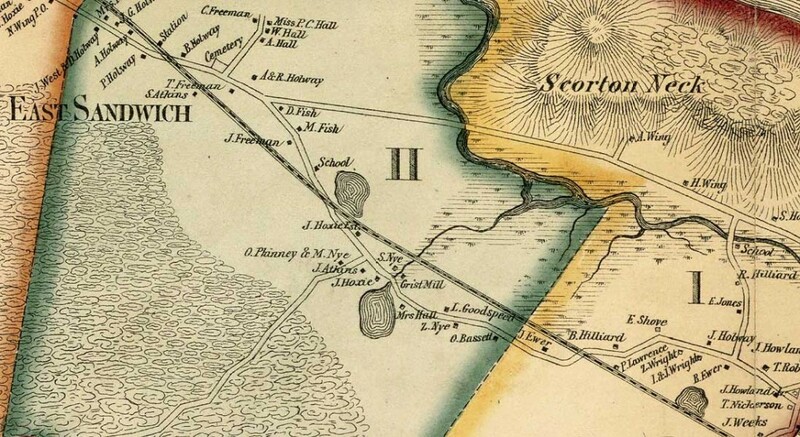 This was a main thoroughfare to and from South Sandwich and was also known as “the Road to Falmouth.” Today it is a dead-end, totally cut off from South Sandwich (and Falmouth) by the Mid-Cape Highway. S. Sullwold Publishing, Inc. Taunton, Mass. 1984. Massachusetts Marriages, 1633-1850 [database on-line]. Provo, UT, USA: Ancestry.com Operations Inc, 2005. This entry was posted in Architecture, Communities, Early Settlers, Historic Buildings, Industry, Schools. Bookmark the permalink.